One of them! One of them! I’ve become a filthy ipod user after years of using my half broken Rio Karma and feeling audiophilically smug. This entry was posted in General and tagged me, photo on September 28, 2008 by Alex. …you’ll have to eat your meat. Or so it seems on emusic, where after many attempts at finding a solution to the problem of licensing the excellent DJ Kicks series of mix albums they have added a new download restriction – albums where you either download the whole thing or nothing. Reaction in the reviews on the albums has been mostly furious, especially as for one of them (Four Tet) they’ve only uploaded part of a mix. I’m not sure I get the anger myself, these are mixes after all, so they should be enjoyed in their totality. On the other hand it is always nice to test the waters on an album with a single track, and restrictions are always a bad idea unless absolutely necessary. Obviously the problem behind this is licensing of compilations. I’ve only ever bought a couple of DJ Kicks albums myself, being the rather excellent ones by Annie and Erlend Ã˜ye (the singing DJ). I have now whacked the Kruder & Dorfmeister onto my save for later pile, which at a mere 295 albums possibly needs a bit of a prune. emusic may be about to suffer interesting times again now as various bigger players move into the non-drm digital music market, hell I’ve even bought a few things from itunes plus, though only because they took too long to appear on emusic. My two year sub with emusic runs out in a couple of months and I’m still pretty likely to renew, having to pay once every so often for access to a huge library of independent music is hard to beat. This entry was posted in General and tagged albums, emusic, music on September 20, 2008 by Alex. (Except maybe to get the image size down to something reasonable. Donâ€™t go posting an eight megapixel image.) Include these instructions. all over the internet here’s your meme you lucky people. Now would be a good time to point out that in a moment of madness I made a page on here of photos of me over the years (which is actually a stalled blog post yet to be edited up) and also that when I remember I do tag myself on flickr. 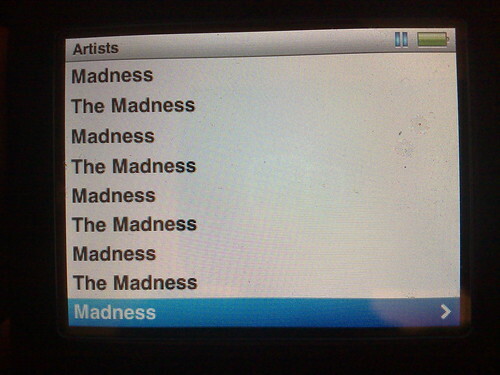 And yes, that is a poor photo, in a fit of annoyance at my post on mp3 player sizes my N95 promptly died on Friday. Must get it to the repair shop tomorrow, for now I’m two generations back on my Sony Ericsson K700i. 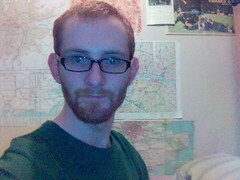 This entry was posted in General and tagged me, meme, photo, selfportrait on September 18, 2008 by Alex.